Analysis of and Prospects for New House and Senate FOIA Bills. This week’s lockstep introduction of bipartisan Freedom of Information Act bills in the House (H.R 653) and the Senate (S 337) is a good sign for those who want the release of more government documents, more quickly, to more people. The House bill was introduced by Representative Darryll Issa (R-Ca) and consponsored by Elija Cummings (D-Md) and Mike Quigley (D-Il). 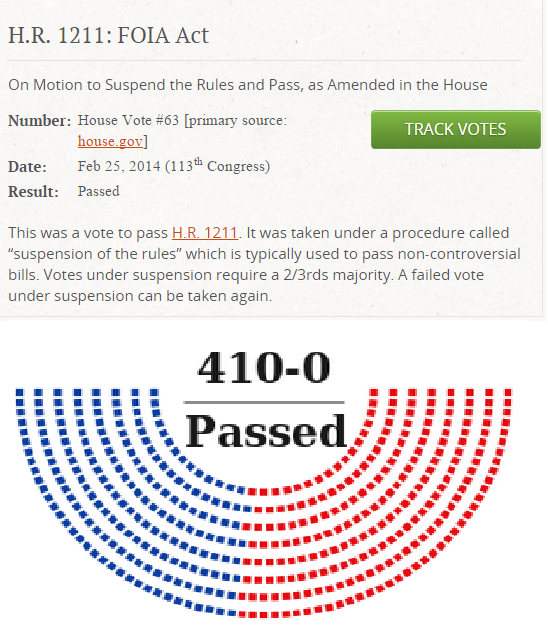 It, on the other hand, is clearly stronger than the House bill that passed 410-0 last session. The House bill also has welcome language instructing (but not enforcing) agencies to “make information public to the greatest extent possible through modern technology.” By my reading, this means that all agencies should match the practices of the State Department, National Archives, agencies participating in FOIA Online (including the Department of Commerce and Environmental Protection Agency) and proactively post the vast majority of FOIA releases online. Though past agency FOIA performance shows this is far from guaranteed. One more bit of language the House bill has that I like is its mandate that agencies’ FOIA processing has “standards for interoperability” in their FOIA processing software. Outdated proprietary software and legacy contracts of FOIA processing programs have led to a profound non-functionality of FOIA technology. The opensource wizzes at 18F are also aware of this problem and working to fix it. In what I believe to be an astute political move, the Senate re-introduced last session’s bill that 100 Senators agreed upon. And Senator Grassley, Chairman of the Senate Judiciary Committee, is moving quickly with it, placing it on the Judiciary Committee’s agenda for (tomorrow!) February 5th. There is a possibility it will be voted out of Committee before the end of the month. Though this is a quick move, I don’t think it is a rash one. Last session Senators Cornyn and Leahy worked agonizingly hard to secure support and assuage worries over FOIA from each Senator (including the removal of a public interest balancing test for Exemption 5 withholdings). I think it’s the smart move not to reopen this can of worms and work with Senators to re-pass the good FOIA bill they supported last session. 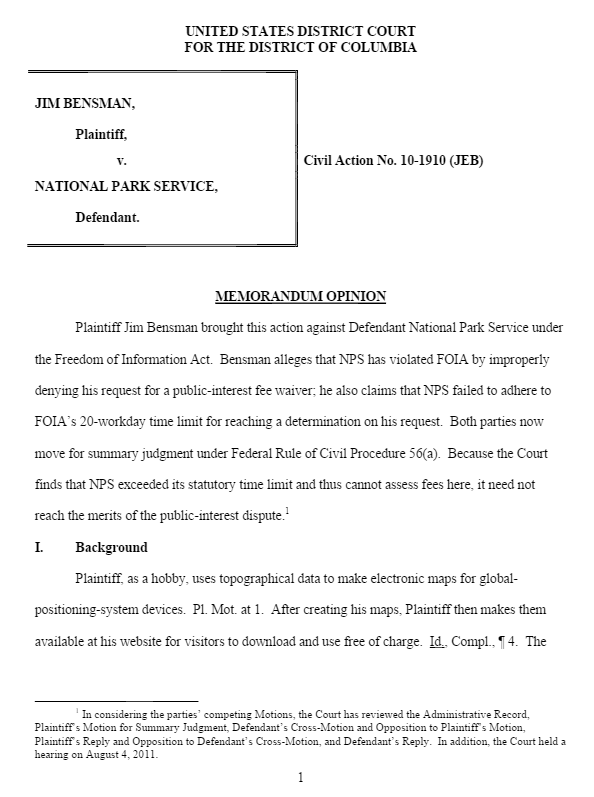 Bensman v National Park Service. There is at least one provision in the Senate bill that House drafters would be wise to adopt in their (I suspect) more expansive Oversight and Government Reform committee amendments. That is something closer to the Senate’s langue on the “fee fix” issue. When media, educational or scientific institutions submit FOIA requests, the majority of their fees are always waived. This is not the case for everyday requesters, who are often charged expensive “search and review” fees. The 2007 Open Government Act partially reduced these fees by mandating that a requester could not be charged fees if an agency missed the 20-day deadline to process the FOIA request. Troublingly, however, agencies (ostensibly with DOJ support) have began successfully eluding this fee improvement simply by labeling requests as “unusual” and claiming that these “unusual” requests were unprotected. The Senate bill makes clear that “unusual” requests (that are fewer than 50,000 pages) get the standard FOIA extension of 10 days. After that an agency can only charge reproduction fees. Codifying the presumption of openness, thereby requiring records be released, unless there is a foreseeable harm or legal requirement to withhold them. 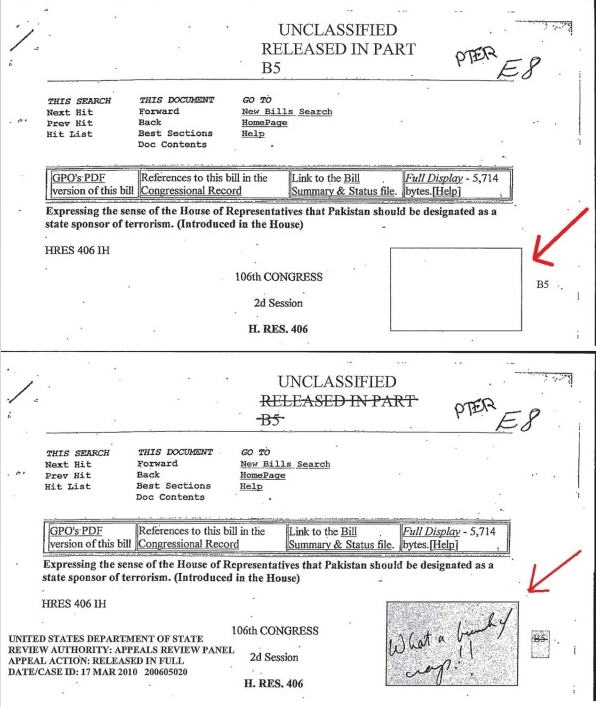 This language mirrors the Obama administration’s and the Department of Justice’s (non binding) instructions on FOIA. Improving public digital access to released records. And, strengthening and increasing the independence of the FOIA Ombuds Office, the Office of Government Information Services (OGIS). Senator Chuck Grassley once threatened to drive his car to the Office of Management and Budget to force the release of blocked FOIA Ombuds recommendations. The way I see it, three hurdles remain before these bills become law. The first is passing out of both committees. Though, with previous bipartisan votes and the support of chairs and ranking members, passage out of committee before Sunshine Week (March 15) 2015 is not impossible. Look for a quick vote in the Senate and a bit more negotiation in the House. The second hurdle will be reconciling Senate and House bills in conference. Last session, the strategy was for the House to adopt the Senate bill after the Senate added key House provisions in the Senate via amendment. This time, I suspect, the Senate and the House will pass their own bills and the differences will be ironed out in conference. Hopefully the strongest portions of both bills will make the final legislation. The Senate bill’s early introduction means that unless Majority Leader Mitch McConnell (R-Ky) obstructs it, it will only require 60 votes to become law, not the support of 100 senators that last session’s time constraints required. The third and final hurdle will be getting House and Senate leadership to bring the final FOIA bills up for a vote. This is where covert lobbying by pro-secrecy government and private interests prevailed last session. This time, at least for now, leadership seems keen to support this bipartisan legislation. Speaker Boehner has pledged that he “look[s] forward to working to resolve this issue [FOIA reform] early in the new Congress.” I predict Majority Leader McConnell will also allow a vote on FOIA reform. Finally, the biggest advantage openness advocates have this time around is that those in favor of secrecy (and Janus-Faced supporters of open government) will have a much harder time running out the clock. 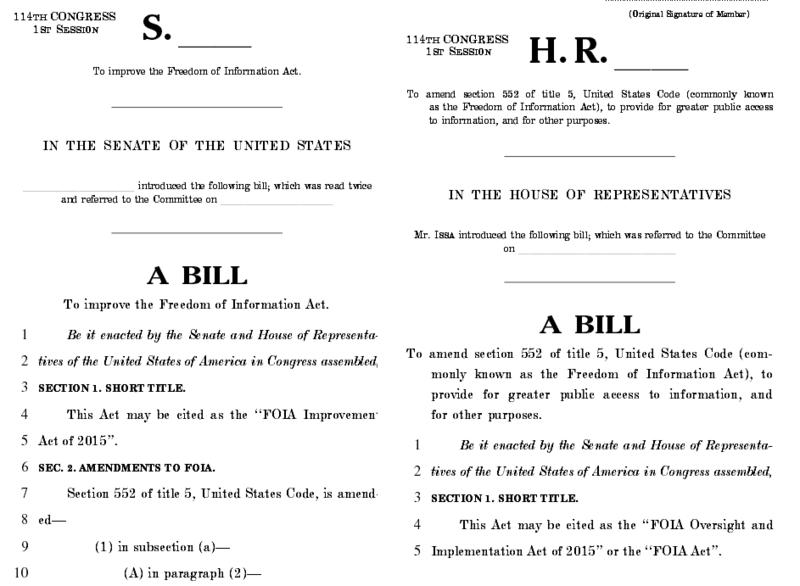 Because these coordinated, bipartisan bills were introduced by Senators Cornyn, Leahy, Grassley, and Representatives Issa, Cummins, and Quigley extremely early in the session, opponents of FOIA reform will have a much harder time stalling or killing these bills.